Rest assured that you receive the best sewing advice when you find out more about us at Hannah Johnson Fabrics in Duluth, Minnesota. The inspiration for Hannah Johnson Fabrics came from Hannah Johnson, the grandmother of Janet Anelli who owns Hannah Johnson Fabrics. Hannah continues to inspire us with her legacy of determination, creativity, and courage. Hannah Johnson was born in a Swedish-speaking farming community in central Minnesota in the late nineteenth century and married Gunnard Johnson, an immigrant from Sweden who served in WWI and obtained his U.S. citizenship after the war. When Hannah was in her early twenties and with three small children she was in an automobile accident that left her wheelchair-bound. Being the strong, determined woman she was before the accident only made her stronger and more determined. 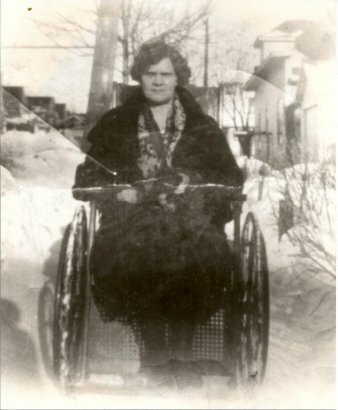 Her husband died when her son was a young man, so she lived alone for many years. She sewed, she cooked, she baked, she knitted, she crocheted and she truly enjoyed doing those things because she brought love, creativity and talent to everything she made. This is the gift of sewing and quilting which is the ability to bring love, creativity, and talent to everything we make. At Hannah Johnson Fabrics, this philosophy is part of everything we do, and part of Hannah Johnson’s legacy that we pass on to you-our valued customers!